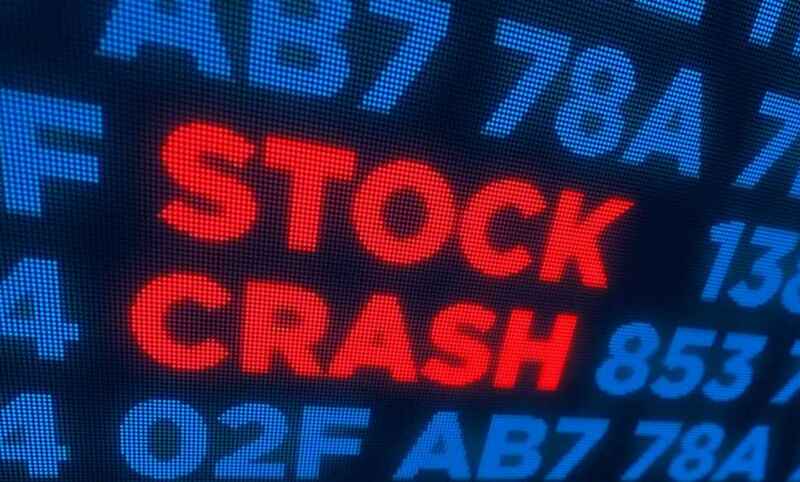 The market is slumping and the question should now be: is this a bad correction or a crash? Having predicted this crash here on Forbes, I of course think this is a crash. Then the question becomes: how big? First, I want to state something I think is important. Predicting the past is easy but predicting the future is hard. This is important because a lot of market commentary is useless because it tries to cover a lack of vision or expertise by wrapping up the past as if it is news. In the market news has no value, only predictions of the future have a point. Trailing indicators are pointless. So when you hear someone saying a market is a bear market because it has fallen 25% it is beyond useless and perhaps, worst still, damaging to your prospects if you think ‘entering a bear market’ is bad. For me this false statement of ‘entering a bear market’ because the market has fallen is almost a buy signal, so clearly declaring a ‘bear market’ is completely wrong. A bear market is when a market begins to trend down and for this market that would probably be last February, nearly a year ago. I was talking about this bear/crash back then and I have saved myself–and I hope some others–a lot of money by not being in the market for the worst of this year long bear market. When a market drops 25% it doesn’t enter a bear market, it has crashed. The profit is in getting out at the top of a bull or soon after and back in at the bottom after the crash and after the end of the bear market, which will be roughly when foolish commentators are falsely announcing the market has entered a bear market. This is important because the big profits are in the incredibly hard game of market timing and to have the commentarians get their concepts discombobulated is a disservice to the novice investors who might not understand that the people they listen to are experts at autocue, not market dynamics. Right now the question is when does this collapse end? Market moves are getting pretty wild it seems, but actually an old school volatility is back and a crash pattern is unfolding like many before it. It will be very easy to get caught trying to catch the bottom only to see the market fall another 5%-10% or even 20% or more on you, so the question is, where is the hard bottom on this crash? I’m writing this as the market rockets 600 points having fallen 600 the day before. This kind of action is typical crash behavior even when the move is hugely positive. Bull markets don’t spike like this. In any event you first must decide ‘is this a crash?’ For me this is now certain enough. Then decide where the bottom is. Here are my guesses on the Dow and Nasdaq. How low can the Nasdaq go? 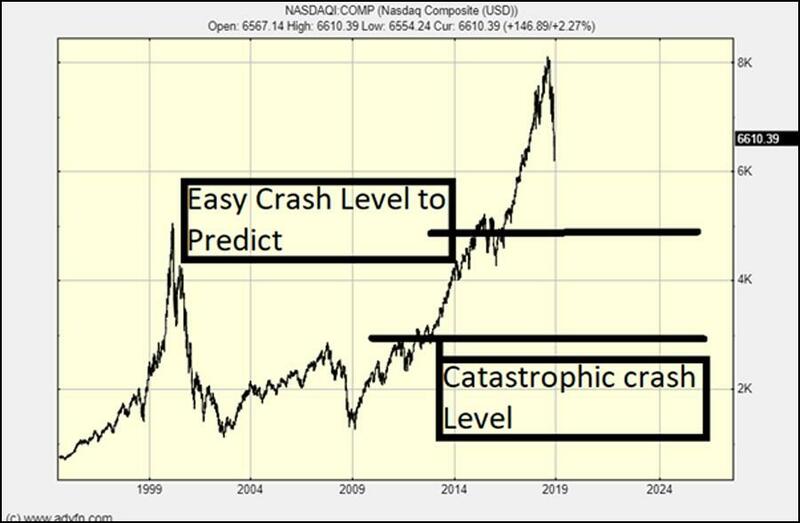 The Nasdaq will undoubtably be the biggest casualty of this crash. It will take a big event to stop a huge crash unfolding. It might happen but I think it unlikely. Conversely, I am tempted to plump for the massive fall back to 3,000 rather than the obvious 5,000 level. 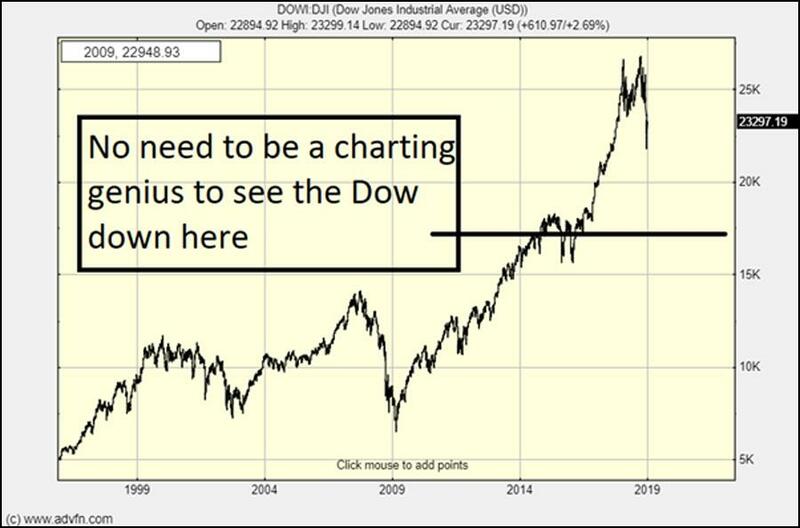 I don’t need to call the right level, the chart will tell the story in due course. 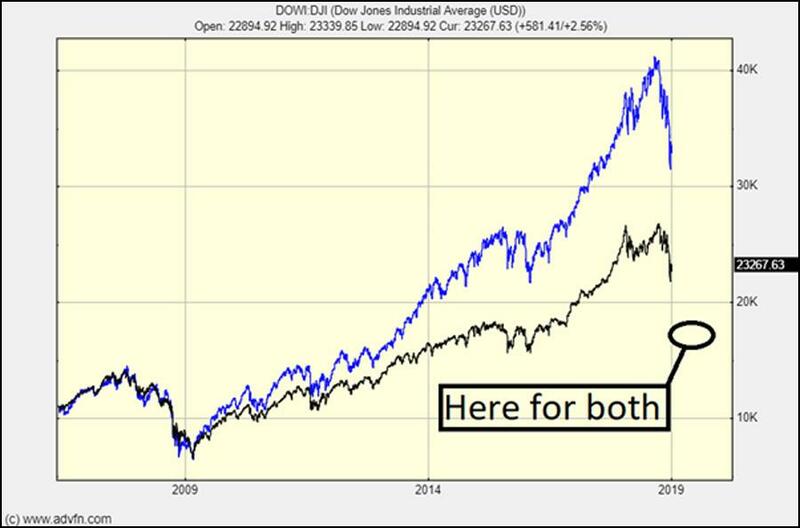 The Nasdaq and the Dow: how far will they fall? If your call is for a crash as mine is, actively reconfigure your portfolio so you can sleep at night with this prospect. Have a ‘get back in’ strategy if suddenly the world changes and gets bullish. Have a ‘get back in strategy’ for ‘the day after the end of the world’ when the crash has happened and the market is in aftermath. I am torn because half of me thinks this is going to be a massive crash and half of me warns against being too extreme in my expectations. This is why I will buy the recovery not the bottom of this crash. The best way to do this is to buy value after the crash has happened or perhaps is even happening. You need to adjust ‘value’ in your mind. The riskier the re-entry the bigger the value needs to be. For some this will be hard as they will want to buy back into stocks like Facebook where value is opaque, but for others, who like old school companies, that decision should be easier. I will say deep value needs to look like ‘ludicrously good value’ at the bottom of the crash, while a few weeks later you can be less strict about it. For now we are off the cliff and it is just a matter of trying to gauge the valley bottom and then the moment when the market will climb the other side. It can’t be underestimated how hard that is going to be, but that is where the big buck profits are to be had. I’ve been saying for the best part of a year, the crash would be caused by the Federal Reserves QT (reverse-QE) and here it is. President Trump recently tweeted at the Fed, ‘Stop with the $50Bs’ so I’m not alone. If the Fed does stop or slow from $50 billion reverse-QE the crash might moderate in line with how much or little QT is happening, or the market will fall as the effect of QT is full factored into prices. That repricing might be well ahead of the end of QT, perhaps a year ahead, but the effect of getting the Federal Reserve’s balance sheet back to old school levels is likely to be shattering. 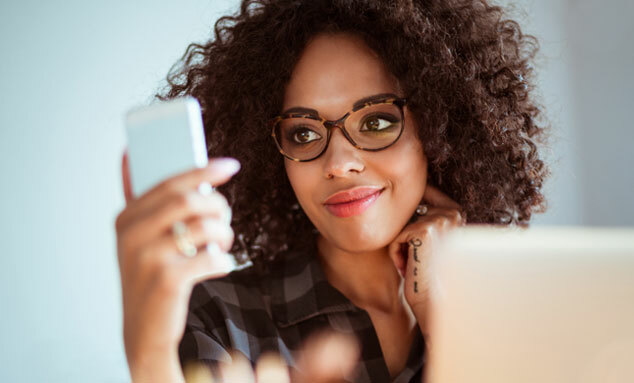 This article was written by Clem Chambers from Forbes and was legally licensed through the NewsCred publisher network. Please direct all licensing questions to legal@newscred.com.